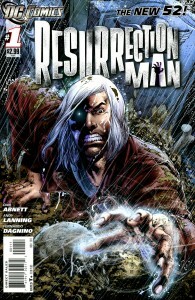 Resurrection Man is one of the more peculiar choices for the DC New 52 relaunch. First, there is his peculiar power. Thanks to an experiment meant to render him invincible, Resurrection Man Mitchell Shelley bounces back from each death in perfect health with a random new super power that he can only discover through trial and error. Otherwise, he’s a a relatively regular guy. Second, he’s largely unknown. He headlined his own 1997-99 monthly series, but has only been seen or heard from a scant handful of times in the intervening decade. Why this new resurrection? The secret ingredient of Mr. Shelley is his writers – Dan Abnett and Andy Lanning AKA DnA. After an ignoble 1988 start on the Real Ghostbusters, they worked their way up the ranks to become one of the hottest writing teams in comics. After penned years of Legion and Majestic for DC they moved on to a multi-year stint on the wildly well-received Marvel Cosmic line. Now they’re back at DC, and back at the helm of their very own hero. How did DnA do with this peculiar pick in the New 52 lineup? Rating: 5 of 5 – Outstanding! Writers Dan Abnett & Andy Lanning (DnA) are perfection in a reunion with their hero Resurrection Man, abetted by fantastic art from Fernando Dagnino. From the intro device of our hero slowly awakening to his new life and his new power to his gruesome death and a final scene of him slipping away from a crash, the script never lets up and maintains a vibe of lingering dread throughout. Resurrection Man Mitch spends most of the book talking to himself and the reader, and you get the sense that his matter-of-fact internal monologue is the majority of conversation in his life. Would a hunted man who dies and dies again have a girlfriend or sidekick handy to chat with? Probably not. 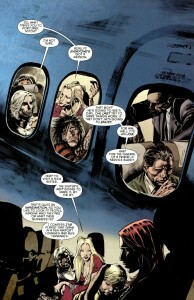 His narrative of fellow passengers via the metal on their bodies is a gem stolen from the mind of Magneto. The implication that he quietly re-experiences the world through each new power he awakens with says much about his solitude. Dagnino’s art is beautiful and perfect for the tone of the script. It reminds me of Gaiman’s Sandman – reminiscent of old Sam Keith, or maybe Jae Lee. It’s the sure black fields of a self-inker, not afraid to get his pages a little dirty with darkness. Colorist Rob Leigh obliges with a set of muted, rusty colors. The result might turn off some readers as too dark or dull, but it sets an 80s Vertigo vibe and couldn’t be any more perfect for DnA’s script. I took special thrill in small details like the burnished exterior of a plane in flight fading back into an interior scene of the plane. The deus ex machina of each resurrection coming with both a new power and an inexplicable compulsion to take action could have seemed forced, but you’ll forget it by the time Mitch boards a plane and meets his “hot, in a Gaga kind of way” seatmate. Clearly there are forces greater than him at work and play here – literal god machines reaching their hands into his life. Is it worth stopping a villain about to kill dozens of people if they were all going to die anyway? Can it even be done? Resurrection Man is a perfect entry into DC’s relaunched lineup of 52 books – his power to start anew from each death is a fitting metaphor for readers picking up his relaunched title with no prior knowledge of the character. DnA have a proven track record of mercilessly dissecting the lives of their heroes to produce fantastically unexpected stories, and Mitch is a rare hero who can walk away from each dissection unharmed.